Today was one cool day, and by cool I mean cold. The weather folks were actually calling for snow this morning. Fortunately we missed the snow, but not the cold. All the riders bundled up with as much warm gear as they could muster and I borrowed a spare jacket from Jack, our eldest cyclist. What a nice guy! Despite the cold a few of us decided to take a royal detour as we departed. It turns out Tupelo is where Elvis Presley was born. Now I’ve never been really into his music or anything, but the man did make history. The detour would be a taking us slightly off the bike route for the morning, but it was a low mileage day (roughly 40 miles) and after all it’s not every day you get to see the birthplace of a rock star as famous as Elvis Presley. I guess that’s another reason it was a cool day. 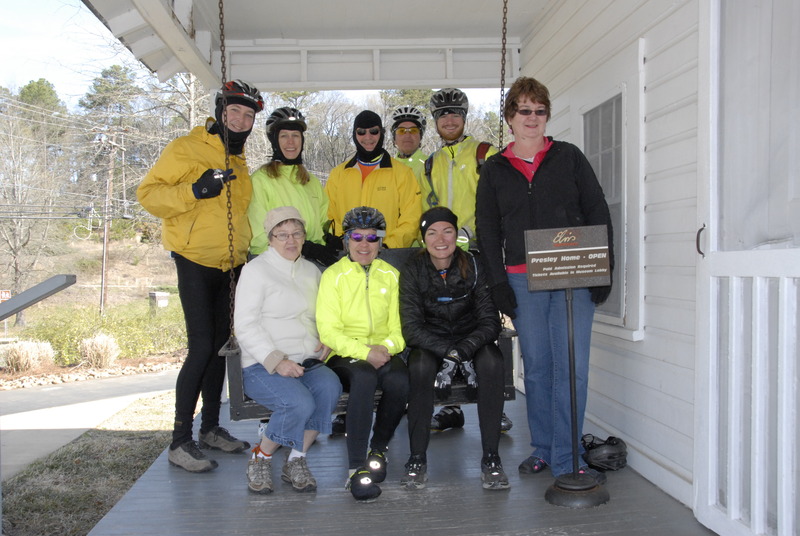 The riders were able to sit on the porch of the house where Elvis grew up; we had our picture taken with a statue of the king of rock and roll at thirteen as well as see the church he attended. There was even a random outhouse that I suppose he must of used because the inside was lined with a glass screen. Why an outhouse? – You may find yourself asking. Your guess is as good as mine. 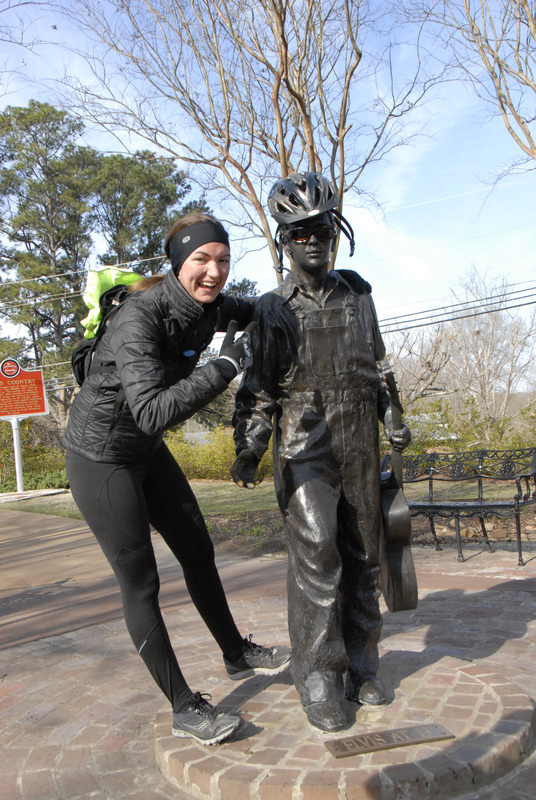 Like I said I’m not really much of an Elvis Presley fan…All the same we certainly found ways to entertain ourselves at the birthplace of this rock and roll king. We arrived in Houston, MS relatively early and we were greeted by the warm aroma of turkey, ham, fresh fruit and a variety of sodas. Parkway Baptist Church not only volunteered to provide us with lunch, but with dinner as well. What a wonderful group of people. Dinner consisted of 30 pounds worth of pulled pork, baked beans with bacon, chips, coleslaw and cookies, banana pudding, cake, a strawberry and whipped cream dish and many other treats. The folks at Parkway Baptist who put this together for us made each one of us feel at home. Their kindness and generosity is truly a blessing. That’s another quality I love about going riding with the Fuller Center, being able to meet such wonderful and caring folks all around the country who are willing to take in complete and total strangers and make them feel like family. The weather folks are calling for rain tomorrow with a high of 48o. Many of us, including myself ventured out to the local Wal-Mart for warmer layers. It’s one thing to be cold and cycling, but it’s another to be wet and cycling. Being cold and wet when cycling can be very uncomfortable, so please keep us in your prayers. All the same I know we’ve geared up the best that we can and I have to believe that the Lord kept us safe from the storm, he kept it from snowing and I know he will see us through our adventures tomorrow.